In the present world, where technology and digital services have taken center stage, finding time to spend with friends and family can be challenging. But there’s a simple answer to this digital fatigue, that is, Nature! Taking to the wilderness with all your friends or colleagues can be the most rewarding experience. However, it’s one that calls for a lot of planning, especially when it comes to meals. You might have friends who are gluten-intolerant or vegetarians. A majority of individuals avoid group camping because they consider the meal planning part to be hectic. How do you provide enough food for a group of 20 or more people? But the truth is that determining group camping meals is only overwhelming if you don’t plan adequately beforehand. With easy-to-make recipes and everyone participating in the preparation process, your group camping experience will be one to remember. Skewers make the best camping meal for two reasons. One, they’re incredibly easy to prepare and two, you can use just about any ingredients that your campers prefer. 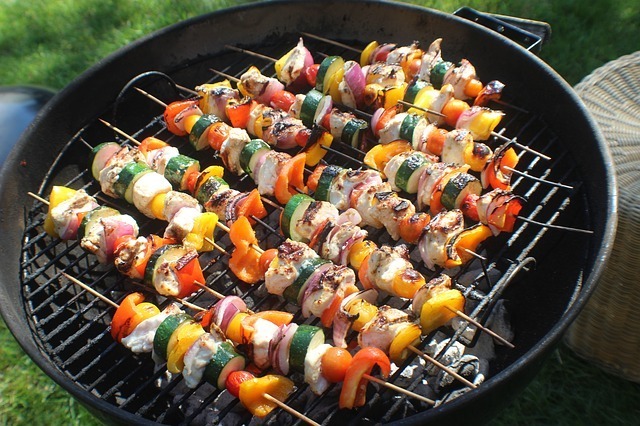 To make its preparation easy, ask your campers to come with a variety of meat products or vegetables, then use them to pack your skewers. To make it all the more interesting, you can have your friends participate in the cooking session. Simply ask each camper to build his or her own skewer. With this recipe, all you need to do is prepare the pasta from home and carry it to your camping trip. You can then heat it up using a big skillet or pot over fire. Also remember to bring a jar of sauce to spice up this dish. With this recipe, you will also have to prepare pasta at home. But rather than having plain pasta, you can add in a couple of veggies and cheese when it’s time for dinner. Start by preparing the noodles at home, then carry them to the camping site. Remember to add some peanut sauce and veggies to allow it to marinate together. You can then request the other campers to bring peanuts and green onions for garnishing. If you’re camping with a large group, there’s no better meal than skillet stir-fry. If you factor in the tons of veggies and possibly a delectable sauce, then this can make an excellent side dish or burger topping. And if you serve it alongside some noodles and rice, this can be a complete meal for dinner or lunch. Since the dawn of history, humans have always loved to feast on chicken. If you’re planning a camping meal for a big group, we recommend going for drumsticks or chicken wings. The bone makes this a meal for everyone to enjoy. And the good thing is that you can fit a ton of wings or drumsticks on a single fire grate. If the main idea behind the group camping is interacting and sitting around the campfire, then you should plan for involving meals- ones that require everyone to participate in their preparation. However, if the expedition involves going for hikes, swimming or fishing, then you should choose meals that are easier to prepare. If you’ll be camping during summer, cold meals are welcome. However, if you’ll be camping during winter, you’re better off with some hot, grilled sandwiches. The downside to this is that you may have to carry additional kitchen equipment such as a Panini press. Put simply; this is a kitchen tool designed for pressing and grilling sandwiches. But considering that there are tons of Panini press models on the market, you’ll need to do some research to find one that meets your needs. Some of the features you should pay attention to include the size, cooking surface area and heating output. Unless one of your friends is willing to bring a refrigerator along, then you need to pack non-perishable foods that won’t go bad even when they’re stored in the cooler. Consider items like canned sauces and soups. Another excellent option is guacamole although you’ll have to cover it in lime juice to prevent it from browning. And when making salads, go for ingredients that don’t wilt such as a cucumber salad. 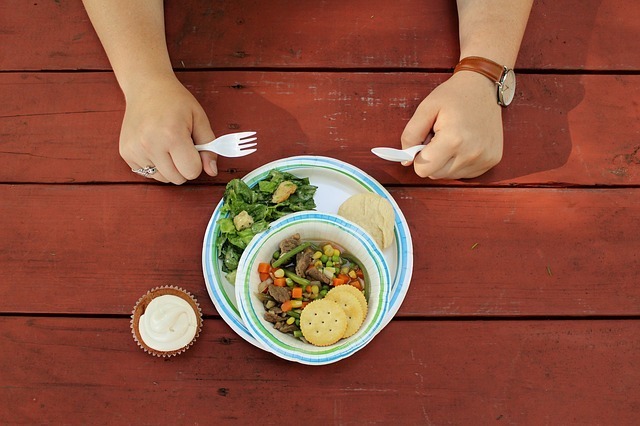 When planning a meal schedule for your camping group, you’ll want to start with the more perishable food products first. For instance, if you brought marinated chicken, you should consume this first. Items such as pre-made pasta can last much longer than the chicken. There’s just something about sitting around a campfire that makes camping so interesting. Looking for dry wood and trying to build the campfire is one activity that will get everyone involved. But a campfire is not only useful in providing warmth but also in preparing food. Sure, it might seem like the food is taking a lifetime to get ready, but ultimately, you’ll end up with a very tasty meal that everyone to enjoy. You can then share stories as you wait for the food to cook. Advisably, you should go for proteins that cook quickly over fire. These include thin-sliced steaks, shrimp or pre-cooked meats. Whenever possible, you should do as much preparation before heading out for the group camp. Look at the meals proposed by your friends and establish what can be done ahead. For instance, you can wash and cut veggies. You can also prepare dishes that cannot spoil quickly. If the work is too much, you can always invite one of the campers to help. What better way to spend summer than to go camping with a large group of friends and family. But one thing you’ll have to plan for before you hit the road is how you’ll feed the entire group during your camping trip. Luckily, there are several meals that are easy to prepare when dealing with large groups. These include skillet stir-fry, pre-made pasta, and skewers.